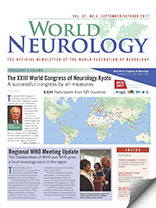 The primary missions of the Journal of the Neurological Sciences are to respond to the requests of the readership and to fulfill the goals of the World Federation of Neurology (WFN). Along those lines, the journal’s Editorial Board has received many requests to publish reviews and guidelines on relevant clinical neurological topics. We are responding by soliciting and publishing more of these types of articles. We also are planning two new special issues within the next several months. The first special issue will deal with the topic of tardive dyskinesia. Traditionally, tardive dyskinesia has been almost impossible to treat effectively. However, two new drugs, valbenazine and deutetrabenazine, are now available for treatment of tardive dyskinesia, making a special issue dealing with the topic of tardive dyskinesia timely. Dr. Daniel Truong, an associate editor of the journal and an expert in this area, will edit this issue. The second special issue will focus on tropical neurology/infectious diseases. Infectious diseases are an extremely important area of tropical neurology, and many readers have indicated that they would like to read a comprehensive review on the topic. The review will cover the most important tropical infectious diseases. As highlighted by the recent epidemic of Zika virus infection, international travel makes it relatively easy for infected patients to arrive in many regions of the world. Thus, health care providers in all parts of the world should have some familiarity with these traditionally tropical diseases. Dr. Chandrashekhar Meshram, Dr. Marco T. Medina, and I will edit this set of articles. The journal and WFN will provide general notification when articles from these special issues are available. In our ongoing attempt to inform readers of important and interesting new developments in the journal, the editorial staff has selected two new “free-access” articles for our readership. The first selected article is a review of post-traumatic dystonia by Karen Frei. This article covers the well-recognized dystonia that follows significant head trauma (i.e., central post-traumatic dystonia) as well as the somewhat controversial dystonia that may follow trauma outside of the central nervous system (i.e., peripheral post-traumatic dystonia). The possible pathogenesis and treatment options are discussed in detail. The second article is a nationwide, multicenter retrospective cohort study from 118 stroke centers in Japan examining the safety of intravenous thrombolysis (IVT) and endovascular therapy (EVT) in patients with acute ischemic stroke who were being treated with direct oral anti-coagulants (DOAC). The use of DOACs, including dabigatran, rivaroxaban, apixaban, or edoxaban has increased, especially in patients with atrial fibrillation. However, guidelines for stroke management in patients who are treated with DOACs differ. The major reason for these differences is that the safety of thrombolysis in acute stroke patients on a DOAC is not well known. Thus, the results of this study are timely. It is important to note that the frequency of symptomatic (2 percent) and asymptomatic (18 percent) intracerebral hemorrhage (ICH) within 24 hours for patients on a DOAC were not significantly different from that of patients on vitamin K-antagonists or on no anticoagulant. The combined use of IVT and EVT did not increase the risk of intracerebral hemorrhage (ICH) in these patients. Multivariate analysis suggested that elevated systolic blood pressure and high blood glucose were independent risk factors for ICH. Data about DOAC last-administration time were available for 52 patients. Among these patients, the rate of ICH was higher in patients who had received a DOAC less than four hours from stroke treatment. If the results of this study are confirmed, reperfusion therapy in acute ischemic stroke may be safer than has been supposed, especially if the above-noted risk factors are considered.